Kiwis welcome a good challenge. Take New Zealander Edmund Hillary. After hundreds of others had failed and some had died trying, Hillary, along with his guide Tenzing Norgay, was the first man to summit the highest point on Earth, Mt. Everest. No doubt inspired by Hillary, his countrymen are today among the world’s elite climbers. The same holds true for New Zealand’s less-famous citizenry. 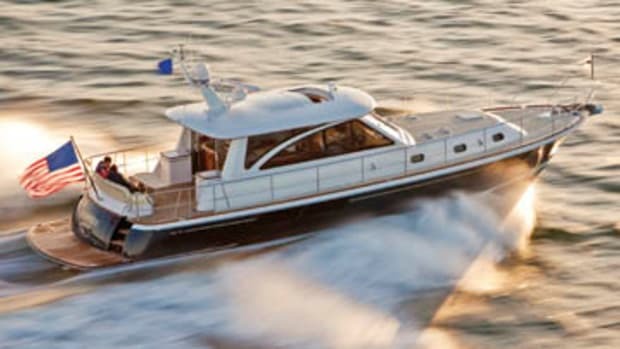 Two years ago, a sailor who had completed a circumnavigation as well as an exploration of Antarctica aboard an Oyster 66 sailboat approached the New Zealand yard about building a jet-driven powerboat. 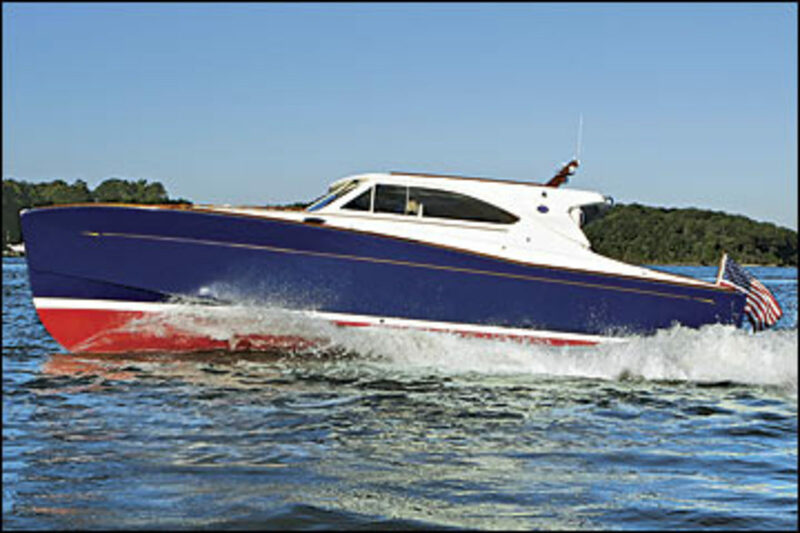 A big name in sailboats, the 33-year old, New Zealand-based builder hadn’t built a powerboat in well over a decade. But in the Kiwi spirit of exploration, it accepted the challenge. Working with Levi Design Group, the company behind Richard Branson’s Virgin Atlantic Challenger II that set a world record in 1986 for fastest Atlantic crossing, Oyster developed the LD43. The resulting Kevlar-and-carbon fiber hull was tank-tested by the Wolfson Unit, a marine technology and industrial aerodynamics outfit based in Southampton, England. Marston was right. I immediately spotted the 43 among a gaggle of Downeast-style boats. 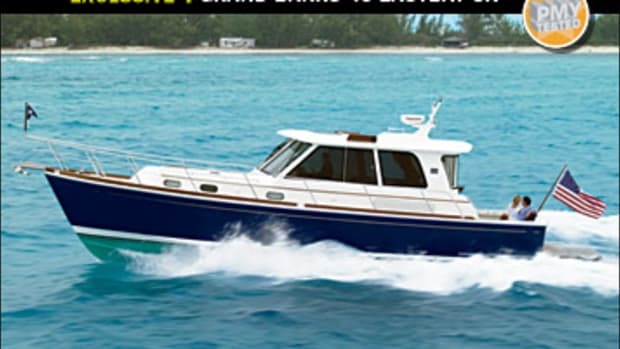 Her exterior is reminiscent of a lobster boat, with a flat roofline, plenty of pilothouse windows, and a cockpit that can accommodate several picnickers. 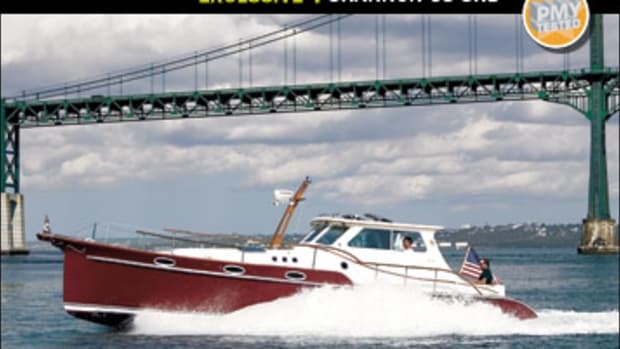 Traditional accents, such as her curvy coach roof and teak accents—the grabrails on the pilothouse and foredeck, radar arch, and rubrails—pay homage to Oyster’s sailing heritage. 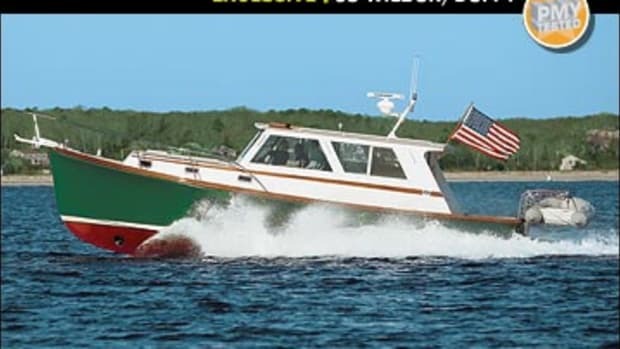 Severely raked side windows give the Oyster the aggressive look of a PT boat and a profile unlike any Downeaster I’ve ever seen. 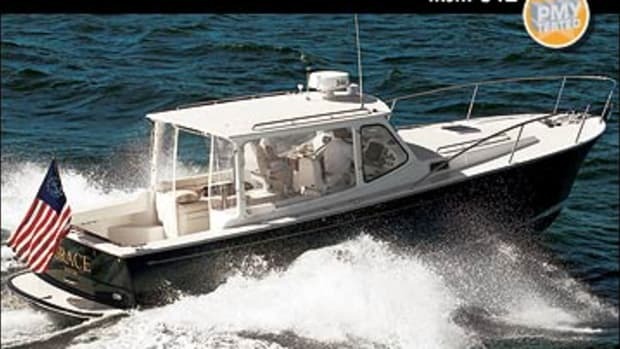 I boarded the 43 from the swim platform through a 28-inch-wide transom door that collapses into a channel on the platform itself; this maintains the 43’s clean lines by doing away with a vertical swinging door and its irritating pins and latches. A gas-assist strut holds it in place. 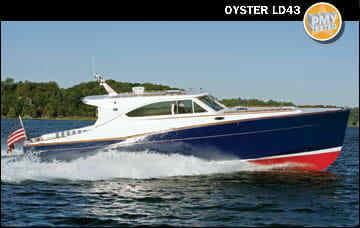 The LD in LD43 stands for lunch and dinner, and the Oyster is equipped for both, with cockpit (lunch) and saloon (dinner) dining areas. Both are fitted with handsome folding teak tables to port and starboard that join in the middle to make one table. The larger, saloon table is 42”L X 66”W, plenty of room for two couples. Butter-soft, cream-leather C-shape settees here contrast nicely with the teak-and-holly sole and teak interior, and they’re roomy enough to function as single berths. 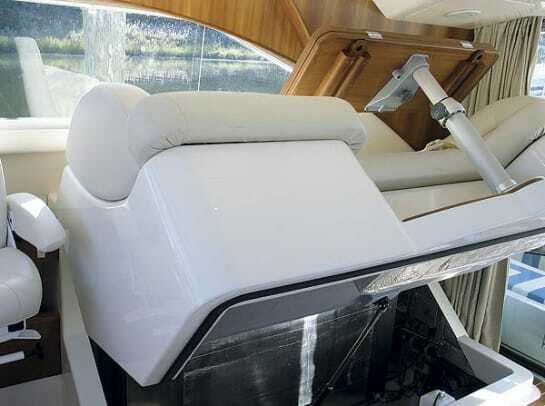 Just forward of the settees are port- and starboard NorSap helm chairs, among the most comfortable and adjustable chairs I have seen. Down a centerline companionway a forepeak stateroom with walkaround queen berth opens to reveal a large, 37”Lx53W”x28”H stowage space, big enough to hold a pair of folding bicycles or a week’s worth of clothes for a cruising couple; what clothing cannot fit here can go in the cedar-lined hanging locker and top-loading compartments to port and starboard. 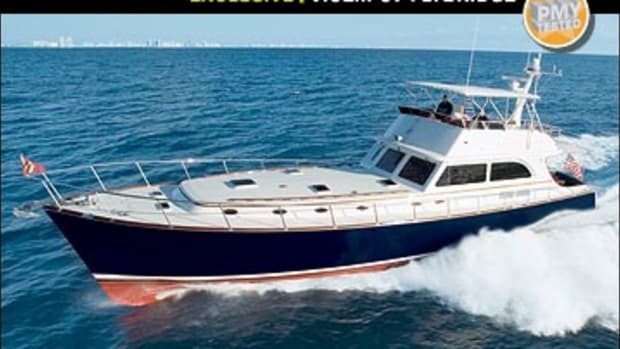 The galley, to port, is equipped with a microwave/convection oven, two-burner cooktop, and a slick, 4.2-cubic-foot stainless steel refrigerator/freezer. Blue Avonite countertops provide a nice contrast to the same grain-matched teak as the stateroom and cockpit, but stowage here is at a premium: For a cruising couple, the galley will provide enough stowage for a four-day weekend’s worth of provisions, but if guests show up, you may have to send out for replenishments after a few meals. The compartments above the countertop hold standard Wedgwood custom china, a classy but space-eating touch. 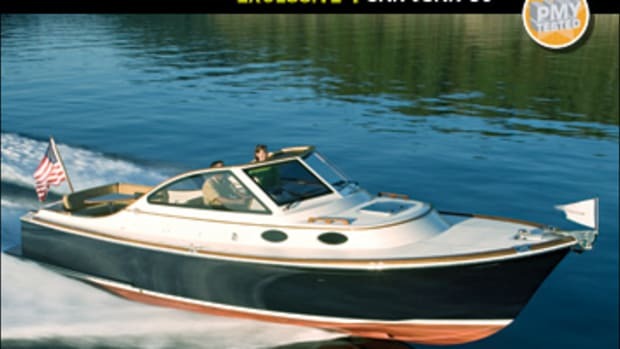 But while the 43 was stylish and plush, I still wondered what kind of performance I’d see from a powerboat that came from a sailboat builder. 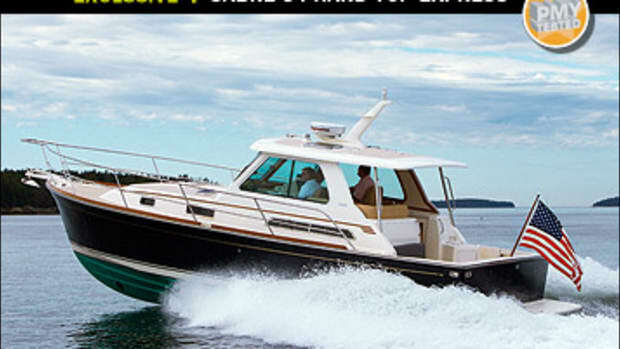 When it came time for the sea trial, a light chop was kicking on the Severn River. I watched as Marston eased her off the dock sideways, using the joystick to manipulate the twin Hamilton HJ 292 waterjets. We switched spots, and I weaved the 43 effortlessly through hundreds of moored boats using only the joystick. 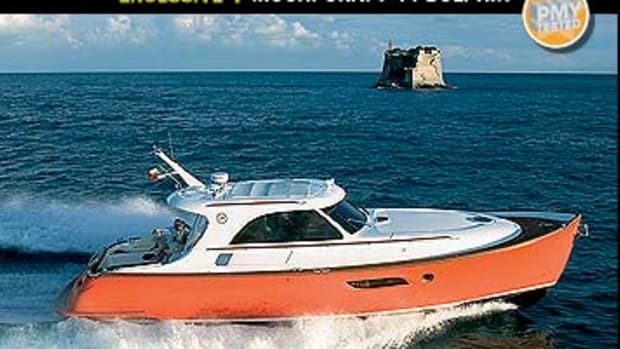 Once we were clear of the mooring field, I maneuvered the 43 through a series of tight turns at a 32-mph cruise, and she came around in less than two boat lengths: Hard chines prevented spray from reaching the windshield, even at a WOT of 36.8 mph, and helped her carve the turns smoothly. Whether I used the wheel or the joystick, maneuvering was effortless, and sightlines were excellent in all directions. When spray did reach the windshield while we were running into the wind, I just trimmed up the bow a bit, and it disappeared. As we idled back in, more than a few salts craned their necks and whistled. At the dock two couples approached me as I loaded test gear into my rental car to inquire about the 43, and they had only seen her profile. "That’s one heck of a lobster boat," they said. I replied, "You should see her interior." At the outset, Marston had explained that Oyster did not want to make a copy of a picnic boat, and as I drove away, I concluded that they certainly had not. Like Hillary, Oyster has risen to the challenge. But then what else would you expect from a Kiwi?